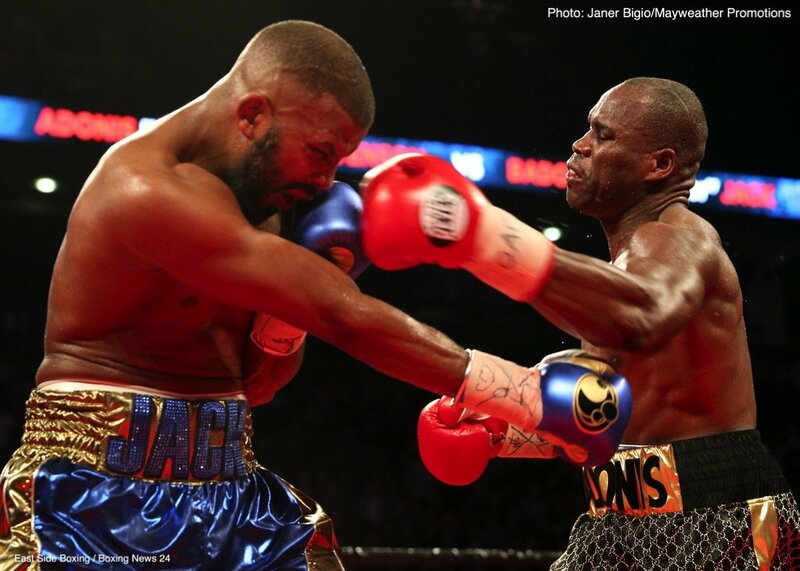 Adonis Stevenson (29-1-1, 24 KOs) had to literally hold on to keep from getting knocked out in the 12th round by former 2 division world champion Badou Jack (22-1-3, 13 KOs) in fighting to a 12 round majority draw at the Air Canada Centre in Toronto, Canada. Stevenson was badly hurt by an uppercut in the last 20 seconds of the 12th. Jack then teed off on Stevenson with a flurry of shots that caught him in the head and had him close to going down. If not for Stevenson clinching so much, he would have been dropped. The judge’s scores were 115-113 for Jack, 114-114 and 114-114. It was an excellent fight. Tonight’s Stevenson vs. Jack fight was televised on Showtime Championship Boxing. It’s likely that the network will push for both fighters to face each other again. You can bet that the 34-year-old Jack will be up for a second fight, but I’m not sure that Stevenson will. Stevenson was fortunate not to have gotten knocked out by Jack in the 12th, because he was close to going down. If this was a 15-round fight like in the old days, I don’t Stevenson would have made it another three years, because he was exhausted and badly hurt. Jack had him figured out in the second half of the fight, although Stevenson did hurt him with a body shot in the 10th. Jack was still the better fighter of the two down the stretch. Referee Ian John Lewis allowed Stevenson to get away with a great deal of holding in the second half of the fight. There’s holding that fighter’s use that is acceptable, but what Stevenson was doing was holding to the point where it was impeding the game from Jack. He literally wasn’t able to throw punches half the time because he was being held, being put in head locks and wrestled nonstop. The referee was absolutely useless in stopping Stevenson’s clinching. The referee was helped Stevenson by allowing him to hold, and keeping Jack from working on the inside by breaking him when he was still throwing punches. The referee had no control over the fight. He was just useless person inside the ring. The 40-year-old Stevenson controlled the first half of the contest in working a timid-looking Jack over with power shots. Jack was moving in circles constantly, throwing very little back and just trying to survive. Stevenson was taunting Jack, asking to stop running and start fighting. When Jack finally did start fighting back in the 7th, he immediately took control of the fight. Jack’s body punching and uppercuts seemed to take the air out of Stevenson right away. It was surprising the way that Stevenson immediately. It wasn’t a matter of Jack wearing him down slowly. It was right away. It makes you wonder what Jack could have done had he started fighting back earlier in the fight. He would have had an excellent chance of winning the fight outright, because he had no gas tank when it came to getting hit back. It took the energy right out of him. In the 11th, Stevenson suffered a bloody nose and the blood was everywhere. It didn’t slow him down. He was still fighting well with the blood coming down. The draw means Stevenson keeps his WBC light heavyweight title. He can either fight Jack again or move on and possibly face Oleksandr Gvozdyk next. That might be an easier fight for Stevenson, because Gvozdyk has looked weak in the chin in the past. It’s possible that Stevenson may get old and lose to Gvozdyk if he comes next fight him. If Stevenson stays out of the ring for another year before he takes that fight, then that will play into Gvozdyk’s hands. Stevenson fought well enough to deserve a victory tonight. Jack didn’t do enough to get the victory. If he had fought harder in the first half of the contest, then I think it would have helped him. Perhaps if Jack had fought harder from the get go, he would have been knocked out by the fresh Stevenson. We’ll never know for sure, because Jack played it safe and appeared to give away 5 of the first 6 rounds. Previous boxing news: Results: Gary Russell Jr. defeats Joseph Diaz Jr.